Just some food for thought when looking at DGB-BTC. I've been looking at it as a long term hold ever since spring of 2017; and after the run up in June/July of 2017. The Citibank awards and even being mentioned on CNBC Fast Money created a fomo that led the price to shoot up into the mid 2000 satoshi range. In December we reached at or near the 800 satoshi levels after a ferver of buying pressure after John McAfee tweeted about Digibyte in a daily series of his tweets about his top alt-coin picks. We got rejected near the 0.236 of the original highs set during the spring and summer and 2017; but if you look closely we have held an upward trendline and just reversed quite hard off of this line. I think it's quite likely we will test the 600-800 satoshi range yet again in the not so distant future; and potentially even take a crack at the 0.236 fib from the ATH's set last year. I sold around 600-650 satoshi on the last pump and started reloading anywhere between 350-400 satoshi's on average. We have ranged between 370-420 for a while but just broke out to 440 at time of this writing. 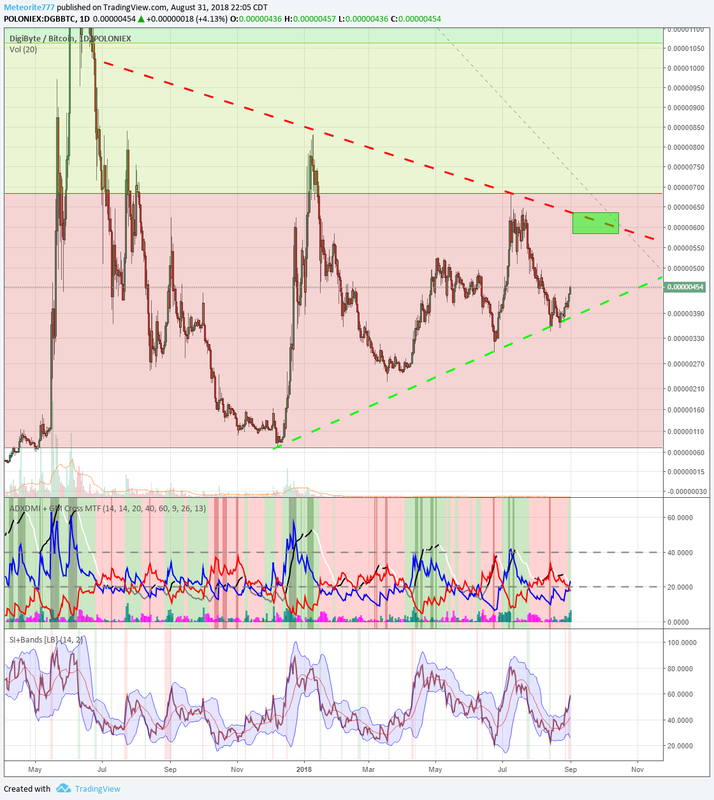 I added an upper trendline to show possible resistance. I think we can place first TP orders at or around the 600 satoshi level with a reasonable expectation of success.